According to some recent research planning annual holidays can be more stressful for some people than planning a wedding. To help take the stress out of holiday planning TripAdvisor, the worlds largest travel website, trolls through millions of reviews a year to come up with a list on just about anything to do with travel. Following hot on the heals of its Top 25 Beaches for 2018 lists is the TripAdvisor Travelers’ Choice Top 25 Destinations for 2018 lists, with the Indonesian island of Bali leading Asean into the world list, ranked number four globally by the TripAdvisor community. 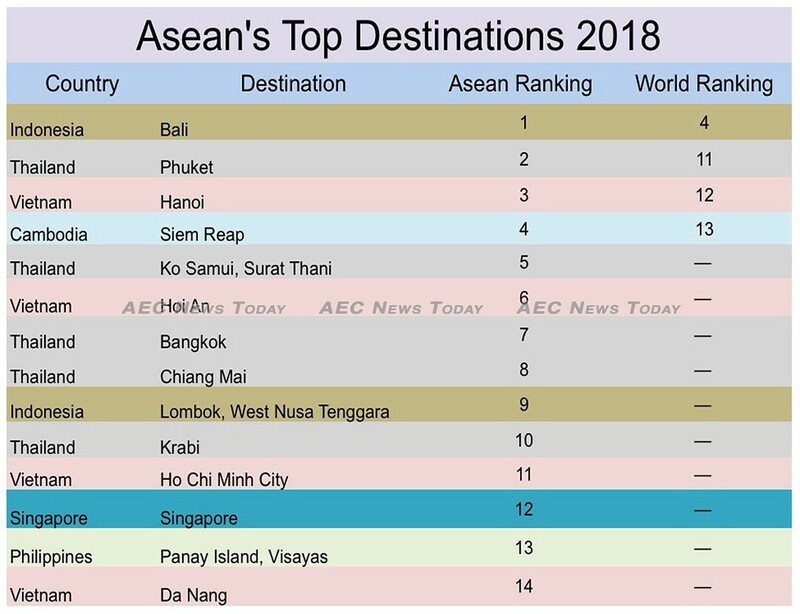 Not so close on the heals of Bali is the Thailand island of Phuket at number 11 globally, followed by Hanoi, Vietnam, and Siem Reap, Cambodia, at positions 12 and 13 respectively; the only other Asean destinations to make it into the global Top 25 destinations for 2018 list. As with the Top Beaches in Asean list we filtered from TripAdvisor’s Top 25 Beaches in Asia list, Thailand similarly dominates our unofficial ‘Top Destinations in Asean’ for 2018 list with a total of five entries: Ko Samui, (Thailand’s second largest island), Bangkok, Chiang Mai, in the north, and Krabi, on southern Thailand’s west coast ranked #5, #7, #8, and #10 respectively. Ranking the third top destination in Asean for 2018 is Hanoi, Vietnam, followed by Siem Reap, Cambodia, home of the ancient Angkor Wat Hindu temple ruins, with the six top destination in Asean going to the central Vietnam coastal city of Hoi An. Filling the tenth top destinations in Asean for 2018 spot is the Indonesian island of Lombok, West Nusa Tenggara at number nine. Ho Chi Minh City, Vietnam comes in at number 11, followed by Singapore at #12, Panay Island, the Philippines at number 13, with the coastal Vietnam city of Da Nang, being Vietnam’s fourth entry into the list, at number 14. According to TripAdvisor, the Travelers’ Choice Awards are compiled using an algorithm based on the quantity and quality of reviews and ratings for hotels, restaurants and attractions in destinations worldwide, gathered over a 12-month period, as well as traveller booking interest on the website. This year 402 destinations are contained in 42 lists covering the world. Highlighting the power of social media the TripAdvisor website entry for Bali shows that it has received more than 2.1 million reviews, including more than 757,000 for 1,352 hotels, more than 813,000 reviews of 5,744 restaurants, and garnered over 103,250 forum posts. In comparison, the second top destination in Asean for 2018, Phuket, has attracted a ‘mere’ 929,323 reviews, including some 367,300 reviews of 791 hotels, 265,424 reviews of 2,672 restaurants, and garnered a little over 58,110 forum posts. 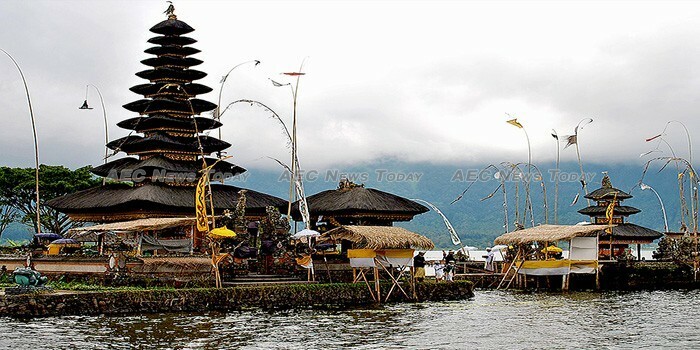 According to provincial government records Bali attracted some 5.67 million tourists last year, drawn by its unspoiled nature spots, endless beaches, wide choice in accommodation, and outstanding restaurants and nightlife, with the repeated forecasts of Mount Agung erupting having only a slight effect on visitor numbers. Thailand offers the region’s most choices for ‘top destinations in Asean’ providing a mix of beache, mountain, and city experiences. Last year more than 35.38 million people visited Thailand, an 8 per cent year-on-year (YoY) increase over 2017, while Indonesia saw a 21.9 per cent YoY increase to 14.04 million foreign visitor arrivals from 11.52 million one year earlier.